This article is about the Pakistani self-governing territory. For other uses, see Kashmir (disambiguation). Azad Jammu and Kashmir (Urdu: آزاد جموں و کشمیر‎ Āzād Jammū̃ o Kaśmīr, translation: Free Jammu and Kashmir), abbreviated as AJK and commonly known as Azad Kashmir, is a nominally self-governing jurisdiction administered by Pakistan. The territory lies west of the Indian-administered state of Jammu and Kashmir, and was part of the former princely state of Jammu and Kashmir. Azad Kashmir is part of the greater Kashmir region, which is the subject of a long-running conflict between Pakistan and India. The territory shares a border with Gilgit-Baltistan, together with which it is referred to by the United Nations and other international organisations as "Pakistan administered Kashmir". 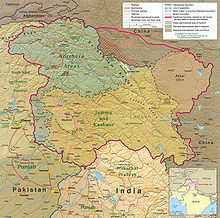 [note 1] Azad Kashmir is one-sixth of the size of Gilgit-Baltistan. The territory also borders Pakistan's Punjab province to the south and Khyber Pakhtunkhwa province to the west. To the east, Azad Kashmir is separated from the state of Jammu and Kashmir by the Line of Control, the de facto border between India and Pakistan. Azad Kashmir has a total area of 13,297 square kilometres (5,134 sq mi), and a total population of 4,045,366 as per the 2017 Census. The northern part of Azad Jammu and Kashmir encompasses the lower area of the Himalayas, including Jamgarh Peak (4,734 m or 15,531 ft). However, Hari Parbat peak in Neelum Valley is the highest peak in the state. Fertile, green, mountainous valleys are characteristic of Azad Kashmir's geography, making it one of the most beautiful regions of the subcontinent. The region receives rainfall in both the winter and the summer. Muzaffarabad and Pattan are among the wettest areas of Pakistan. Throughout most of the region, the average rainfall exceeds 1400 mm, with the highest average rainfall occurring near Muzaffarabad (around 1800 mm). During the summer season, monsoon floods of the rivers Jhelum and Leepa are common due to extreme rains and snow melting. In Spring 1947, an uprising against the Maharaja broke out in Poonch, an area bordering the Rawalpindi division of West Punjab. Maharaja's administration is said to have started levying punitive taxes on the peasantry which provoked a local revolt and the administration resorted to brutal suppression. The area's population, swelled by recently demobilised soldiers following World War II, rebelled against the Maharaja's forces and gained control of almost the entire district. Following this victory, the pro-Pakistan chieftains of the western districts of Muzaffarabad, Poonch and Mirpur proclaimed a provisional Azad Jammu and Kashmir government in Rawalpindi on October 3, 1947. [note 2] Ghulam Nabi Gilkar, under the assumed name "Mr. Anwar," issued a proclamation in the name of the provisional government in Muzaffarabad. However, this government quickly fizzled out with the arrest of Anwar in Srinagar. On October 24, a second provisional government of Azad Kashmir was established at Palandri under the leadership of Sardar Ibrahim Khan. Brad Adams the Asia director at the U.S.-based NGO Human Rights Watch has said in 2006; "Although 'azad' means 'free,' the residents of Azad Kashmir are anything but, the Pakistani authorities govern Azad Kashmir government with tight controls on basic freedoms." Scholar Christopher Snedden has observed that despite tight controls the people of Azad Kashmir have generally accepted whatever Pakistan has done to them, which in any case has varied little from how most Pakistanis have been treated (by Pakistan). According to Christopher Snedden one of the reasons for this was that the people of Azad Kashmir had always wanted to be a part of Pakistan. According to the project report by the Asian Development Bank, the bank has set out development goals for Azad Kashmir in the areas of health, education, nutrition, and social development. The whole project is estimated to cost US$76 million. Germany, between 2006 and 2014, has also donated $38 million towards the AJK Health Infrastructure Programme. The population of Azad Kashmir, according to the preliminary results of the 2017 Census, is 4.45 million. The website of the AJK government reports the literacy rate to be 74%, with the enrolment rate in primary school being 98% and 90% for boys and girls respectively. The population of Azad Kashmir is almost entirely Muslim. The people of this region culturally differ from the Kashmiris living in the Kashmir Valley of Jammu and Kashmir, and are closer to the culture of Jammu. Mirpur, Kotli and Bhimber are all old towns of the Jammu region. Gujjars – They are an agricultural tribe and are estimated to be the largest community living in Azad Jammu and Kashmir. Sudhans – (also known as Sudhozai) are second largest tribe of the state, mostly living in Poonch, Sudhanoti, Bagh and Kolti districts. the tribe claims a Pashtun ancestry. Jats – They are one of the larger community of AJK and primarily inhabit the Districts of Mirpur, Bhimber and Kotli. A large Mirpuris population lives in the UK and it is estimated that more people of Mirpuri origins are now residing in the UK than in Mirpur district. The district Mirpur retains strong ties with the UK. Awans – A clan with significant numbers found in Azad Jammu and Kashmir, living mainly in the Bagh Poonch, Hattian Bala and Muzaffarabad. Besides Azad Kashmir they also reside in Punjab and Khyber Pakhtunkhwa in large numbers. Abbasis – They are a large clan in Azad Jammu and Kashmir and mostly live in Bagh, Hattian Bala and Muzaffarabad districts. Besides Azad Kashmir, they also inhabit, Abbottabad and upper Potohar Punjab in large numbers. Kashmiris – Ethnic Kashmiri populations are found in Neelam Valley and Leepa Valley. The culture of Azad Kashmir has many similarities to that of northern Punjabi (Potohar) culture in Punjab province, while the Sudhans have oral tradition of Pashtuns, Peshawari turban is one of famous element wore by Sudhans. The official language of Azad Kashmir is Urdu,[note 3] while English is used in higher domains. The majority of the population, however, speak dialects of the Pahari-Pothwari language complex. These are also spoken across the Line of Control in neighbouring areas of Indian Jammu and Kashmir, and are closely related both to Punjabi to the south and Hinko to the northwest. The language variety in the southern districts of Azad Kashmir is known by a variety of names – including Mirpuri, Pothwari and Pahari – and is closely related to the Pothwari proper spoken to the east in the Pothohar region of Punjab. The dialect(s) of the central districts are occasionally referred to in the literature as Chibhali or Punchi, but the speakers themselves usually call them Pahari, an unfortunately ambiguous name that is also used for several unrelated languages of the Lower Himalayas. Going north, the speech forms gradually change into Hindko. Already in Muzaffarabad District the preferred local name for the language is Hindko, although it is still apparently more closely related to the core dialects of Pahari. Further north in the Neelam Valley, the dialect, locally known as Parmi, is more unambiguously subsumed under Hindko. Another major language of Azad Kashmir is Gujari. It is spoken by several hundred thousand[note 4] people among the traditionally nomadic Gujars, many of whom are nowadays settled. Not all ethnic Gujars speak Gujari, the proportion of those who have shifted to other languages is probably higher in southern Azad Kashmir. Gujari is most closely related to the Rajasthani languages (particularly Mewati), although it also shares features with Punjabi. It is dispersed over large areas in northern Pakistan and India. Within Pakistan, the Gujari dialects of Azad Kashmir are more similar, in terms of shared basic vocabulary and mutual intelligibility, to the Gujar varieties of the neighbouring Hazara region than to the dialects spoken further to the northwest in Khyber Pakhtunkhwa and north in Gilgit. There are scattered communities of Kashmiri speakers, notably in the Neelam Valley, where they form the second-largest language group after speakers of Hindko. There have been calls for the teaching of Kashmiri (particularly in order to counter India's claim of promoting the culture of Kashmir), but the limited attempts at introducing the language at the secondary school level have not been successful, and it is Urdu, rather than Kashmiri, that Kashmiri Muslims have seen as their identity symbol. There is an ongoing process of gradual shift to larger local languages, but at least in the Neelam Valley there still exist communities for whom Kashmiri is the sole mother tongue. In the northernmost district of Neelam there are pockets of other languages: Shina, with two distinct varieties spoken in three villages, Pashto, the language of two villages on the Line of Control, and the endangered Kundal Shahi, spoken by some of the inhabitants of the eponymous village and the only language not found outside Azad Kashmir. Neelum valley is a popular tourist destination in Azad Kashmir. Historically the economy of Azad Kashmir has been agricultural which meant that land was the main source or mean of production. This means that all food for immediate and long term consumption was produced from land. The produce included various crops, fruits, vegetables etc. Land was also the source of other livelihood necessities such as wood, fuel, grazing for animals which then turned into dairy products. Because of this land was also the main source of revenue for the governments whose primary purpose for centuries was to accumulate revenue. The migration to UK was accelerated and by the completion of Mangla Dam in 1967 the process of 'chain migration' became in full flow. Today, remittances from British Mirpuri community make a critical role in AJK's economy. In the mid-1950s various economic and social development processes were launched in Azad Kashmir. In the 1960s, with the construction of the Mangla Dam in Mirpur District, the Azad Jammu and Kashmir Government began to receive royalties from the Pakistani government for the electricity that the dam provided to Pakistan. During the mid-2000s, a multibillion-dollar reconstruction began in the aftermath of the 2005 Kashmir earthquake. Sudhanoti is one of the eight districts of Azad Kashmir in Pakistan. Sudhanoti is located 90 km (56 mi) away from Islamabad, the Capital of Pakistan. It is connected with Rawalpindi and Islamabad through Azad Pattan road. The literacy rate in Azad Kashmir was 62% in 2004, higher than in any other region of Pakistan. However, only 2.2% were graduates, compared to the average of 2.9% for Pakistan. The following is a list of undergraduate medical institutions recognised by Pakistan Medical and Dental Council (PMDC) as of 2013[update]. Football, cricket and volleyball are very popular in Azad Kashmir. Many tournaments are also held throughout the year and in the holy month of Ramazan night-time flood-lit tournaments are also organised. ^ Officially, Mirpur and Poonch districts were in the Jammu province of the state and Muzaffarabad was in the Kashmir province. All three provinces spoke languages related to Punjabi, not the Kashmiri language spoken in the Kashmir Valley. ^ Snedden (2013, p. 176): On p. 29, the census report states that Urdu is the official language of the Government of Azad Kashmir, with Kashmiri, Pahari, Gojri, Punjabi, Kohistani, Pushto and Sheena 'frequently spoken in Azad Kashmir'. Yet, when surveyed about their 'Mother Tongue', Azad Kashmiris' choices were limited to selecting from Pakistan's major languages: Urdu, Punjabi, Sindhi, Pushto, Balochi, Saraiki and 'Others'; not surprisingly, 2.18 million of Azad Kashmir's 2.97 million people chose 'Others'. ^ Hallberg & O'Leary (1992, p. 96) report two rough estimates for the total population of Gujari speakes in Azad Kashmir: 200,000 and 700,000, both from the 1980s. ^ a b Richard M. Bird; François Vaillancourt (December 4, 2008). Fiscal Decentralization in Developing Countries. Cambridge University Press. pp. 127–. ISBN 978-0-521-10158-5. ^ "Territorial limits". Herald. May 7, 2015. Archived from the original on July 24, 2015. Retrieved July 24, 2015. These are self-ruled autonomous regions. But restrictions apply. ^ "Kashmir profile". BBC. November 26, 2014. Archived from the original on July 24, 2015. Retrieved July 24, 2015. ^ Chandra, Bipan; Mukherjee, Aditya; Mukherje, Mridula (2008). India since Independence. Penguin Books India. p. 416. ISBN 0143104098. ^ Bose, Sumantra (2009). Contested lands: Israel-Palestine, Kashmir, Bosnia, Cyprus and Sri Lanka. Harvard University Press. p. 193. ISBN 0674028562. ^ Behera, Navnita Chadha (2007). Demystifying Kashmir. Pearson Education India. p. 66. ISBN 8131708462. ^ "Gilgit-Baltistan: Story of how region 6 times the size of PoK passed on to Pakistan". ^ "Underdevelopment in AJK". www.thenews.com.pk. Retrieved June 18, 2016. ^ "Education emergency: AJK leading in enrolment, lagging in quality – The Express Tribune". The Express Tribune. March 26, 2013. Retrieved June 18, 2016. ^ "The J&K conflict: A Chronological Introduction". India Together. Retrieved June 5, 2010. ^ a b Britannica Concise Encyclopedia. "Kashmir (region, Indian subcontinent) – Britannica Online Encyclopedia". Encyclopædia Britannica. Retrieved June 5, 2010. ^ Snedden, Christopher (2013). Kashmir-The Untold Story. HarperCollins Publishers India. p. 14. ISBN 978-93-5029-898-5. Similarly, Muslims in Western Jammu Province, particularly in Poonch, many of whom had martial capabilities, and Muslims in the Frontier Districts Province strongly wanted J&K to join Pakistan. ^ Bose 2003, pp. 32–33. ^ Snedden 2013, p. 59. ^ Snedden 2013, p. 61. ^ "Kashmir: Why India and Pakistan fight over it". November 23, 2016 – via www.bbc.com. ^ Bose 2003, pp. 35–36. ^ "UN resolution 47". Retrieved September 11, 2012. ^ "UNCIP Resolution of August 13, 1948 (S/1100) – Embassy of India, Washington, D.C." Archived from the original on October 13, 2007. ^ "UNMOGIP: United Nations Military Observer Group in India and Pakistan". Archived from the original on May 14, 2008. ^ "How free is Azad Kashsmir". ^ a b c "Azad Jammu and Kashmir – Introduction". Archived from the original on September 27, 2007. Retrieved June 22, 2010. ^ a b "AJ&K Portal". ajk.gov.pk. ^ "Pakistan to observe Kashmir Solidarity Day today". The Hindu. February 5, 2007. Retrieved February 5, 2008. ^ Adams, Brad. "Pakistan: 'Free Kashmir' Far From Free". Human Rights Watch. ^ a b c d e Snedden, Christopher (2013). Kashmir-The Untold Story. Harper Collins Publishers India. p. 93. ISBN 978-93-5029-898-5. Second, Azad Kashmiris had always wanted to be part of this nation. ^ "Administrative Setup". ajk.gov.pk. Archived from the original on April 9, 2010. Retrieved May 17, 2010. ^ "Census 2017: AJK population rises to over 4m". The Nation. August 26, 2017. Retrieved June 10, 2018. ^ "AJ&K at a Glance". Retrieved June 10, 2018. ^ Human Rights Watch (September 2006). "With Friends Like These..." (Report). 18. Human Rights Watch. Retrieved November 24, 2013. ^ Snedden, Christopher (2015). Understanding Kashmir and Kashmiris. Oxford University Press. p. 23. ISBN 978-1-84904-622-0. Confusingly, the term 'Kashmiri' also has wider connotations and uses. Some people in Azad Kashmir call themselves 'Kashmiris'. This is despite most Azad Kashmiris not being of Kashmiri ethnicity. ^ Coakley, John (August 2, 2004). The Territorial Management of Ethnic Conflict. Routledge. p. 153. ISBN 9781135764425. ^ Syed Ali (1998). "South Asia: The Perils of Covert Coercion". In Lawrence Freedman (ed.). Strategic Coercion: Concepts and Cases. Oxford University Press. p. 253. ISBN 0-19-829349-6. ^ Moss, Paul (November 30, 2006). "South Asia | The limits to integration". BBC News. Retrieved June 5, 2010. ^ Snedden, Christopher (2015). Understanding Kashmir and Kashmiris. Oxford University Press. p. 23. ISBN 978-1-84904-622-0. ^ a b Rahman 1996, p. 226. ^ The preceding paragraph is mostly based on Lothers & Lothers (2010). For further references, see the bibliography in Pahari-Pothwari. ^ Akhtar & Rehman 2007, p. 68. The conclusion is based on lexical similarity and the comparison is with the Hindko of the Kaghan Valley and with the Pahari of the Murre Hills. ^ Hallberg & O'Leary 1992, pp. 96, 98, 100. ^ Hallberg & O'Leary 1992, pp. 93–94. ^ Hallberg & O'Leary 1992, pp. 111–12, 126. ^ Akhtar & Rehman 2007, p. 70. ^ Rahman 1996, p. 226; Rahman 2002, pp. 449–50. The discussion in both cases is in the broader context of Pakistan. ^ Akhtar & Rehman 2007, pp. 70, 75. ^ Akhtar & Rehman 2007. ^ "History of Planning & Development Department in AJK". Archived from the original on April 11, 2010. ^ "Azad Jammu & Kashmir – Tourism". Archived from the original on May 29, 2008. Retrieved June 22, 2010. ^ a b Naqash, Tariq (October 1, 2006). "'Rs1.25 trillion to be spent in Azad Kashmir': Reconstruction in quake-hit zone". Dawn. Muzaffarabad. ^ Abid Qaiyum Suleri; Kevin Savage. "Remittances in crises: a case study from Pakistan" (PDF). Archived from the original (PDF) on August 22, 2007. Retrieved June 5, 2010. ^ "'Literacy Rate in Azad Kashmir nearly 62 pc'". Pakistan Times. MUZAFFARABAD (Azad Kashmir). September 27, 2004. Archived from the original on February 27, 2005. ^ Hasan, Khalid (April 17, 2005). "Washington conference studies educational crisis in Pakistan". Daily Times. Washington. Archived from the original on June 7, 2011. Grace Clark told the conference that only 2.9% of Pakistanis had access to higher education. ^ "Our Institutions". Higher Education Commission of Pakistan. Archived from the original on October 29, 2013. Retrieved November 19, 2013. ^ "Recognized medical colleges in Pakistan". Pakistan Medical and Dental Council. Archived from the original on August 19, 2010. Retrieved November 19, 2013. Akhtar, Raja Nasim; Rehman, Khawaja A. (2007). "The Languages of the Neelam Valley". Kashmir Journal of Language Research. 10 (1): 65–84. ISSN 1028-6640. Bose, Sumantra (2003). Kashmir: Roots of Conflict, Paths to Peace. Harvard University Press. ISBN 0-674-01173-2. Hallberg, Calinda E.; O'Leary, Clare F. (1992). "Dialect Variation and Multilingualism among Gujars of Pakistan". In O'Leary, Clare F.; Rensch, Calvin R.; Hallberg, Calinda E. (eds.). Hindko and Gujari. Sociolinguistic Survey of Northern Pakistan. Islamabad: National Institute of Pakistan Studies, Quaid-i-Azam University and Summer Institute of Linguistics. pp. 91–196. ISBN 969-8023-13-5. Lothers, Michael; Lothers, Laura (2010). Pahari and Pothwari: a sociolinguistic survey (Report). SIL Electronic Survey Reports. 2010-012. Rahman, Tariq (1996). Language and politics in Pakistan. Oxford University Press. ISBN 978-0-19-577692-8. Rahman, Tariq (2002). Language, ideology and power : language learning among the Muslims of Pakistan and North India. Karachi: Oxford University Press. ISBN 978-0-19-579644-5. Snedden, Christopher (2013) [first published as The Untold Story of the People of Azad Kashmir, 2012]. Kashmir: The Unwritten History. HarperCollins India. ISBN 9350298988. Mathur, Shubh (2008). "Srinagar-Muzaffarabad-New York: A Kashmiri Family's Exile". In Roy, Anjali Gera; Bhatia, Nandi (eds.). Partitioned Lives: Narratives of Home, Displacement and Resettlement. Pearson Education India. ISBN 9332506205. Schoefield, Victoria (2003) [First published in 2000]. Kashmir in Conflict. London and New York: I. B. Taurus & Co. ISBN 1860648983. Wikimedia Commons has media related to Azad Kashmir. This page was last edited on 6 April 2019, at 23:10 (UTC).